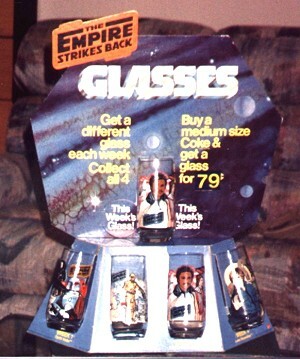 Burger King issued counter top displays for each of its 3 drinking glass promotions--one for Star Wars, one for Return of the Jedi, and this one, for The Empire Strikes Back. They held the four glasses offered during each promotion, and provided a space for the display of the glass that was available at a particular point in time (they were made available one-at-a-time, over a span of four weeks). Among the many Burger King displays that are available, this one is one of the most interesting. I just love the red ESB logo that rises off the top.